4 Ft Sweetheart tables features a wooden top and is just the right size for an intimate dinner for two. This table can also be used as a cake table or accessory table. This table rental fits together with other tables of the same width (see 6 ft and 8ft banquet tables). We also carry a plastic top version that is slightly different in width, but also works well as an accessory table at any function. 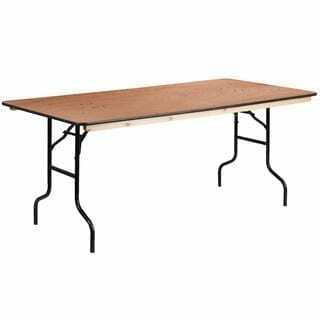 For all table rental options please click here. For chair rental options please click here.